Although the foldable Samsung Galaxy X will probably not hit the market before the end of the year, insiders familiar with the matter claim that an updated prototype has been shown at CES to a few chosen ones. Although the first such device to hit the market arrived a few years ago, those who want a handset with a foldable display do not have many choices at their disposal nowadays. In fact, the ZTE Axon M is the only Android smartphone with a foldable display available for purchase in the US in this moment. However, the rumors of a foldable Samsung Galaxy smartphone have been around for a long time, and a working prototype was unveiled last year, at the Mobile World Congress trade show in Barcelona. According to South Korean website ETNews, "Samsung set up a private exhibition room at CES 2018 in order to introduce its foldable smartphones for only VIP customers and shared specifications and release date of foldable smartphones." Sadly, the details were only shared with those VIP customers and they probably signed an NDA before attending the event. The news report about the Samsung Galaxy X reveals a few general facts regarding the device's display, but nothing about any other technical specs. 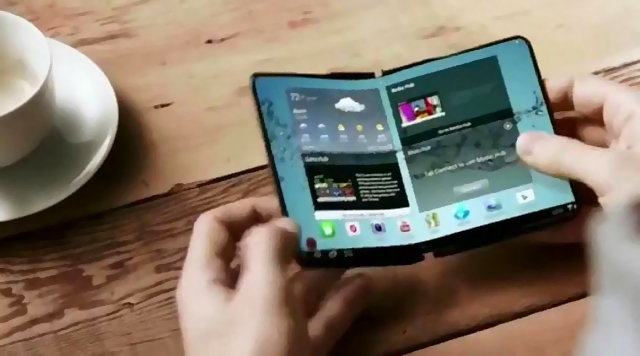 The latest Samsung Galaxy X update apparently features a 7.3-inch foldable display with an in-folding curvature of 1R (0.1 mm curvedness of a circle with a 1 mm radius) and an out-folding curvature of 5R. Samsung's goal when developing this touchscreen display technology was to create a panel that can be easily folded and unfolded for more than 200,000 times. Unfortunately, they might not be there just yet, since the launch date of the company's first foldable handset is still not set. However, a Samsung representative was quoted by ETNews saying that the release of the company's first foldable smartphone might occur during the second half of 2018, so we should probably get ready for some fresh rumors.